GCA Social Gathering June 12th 7-9pm at the Garden Hill Rec center. 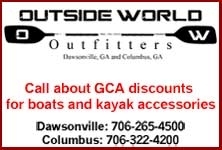 Juliet Jacobsen Kastorff from Endless River Adventures will join us for a great evening. She will update us on the latest on the 2013 International Freestyle Competition and share her experiences of paddling internationally and why it can be so rewarding. 335 Pine Tree Dr. NE.